Uttar Pradesh government in 1976 established New Okhla Industrial Development Authority (NOIDA) under the state industrial act – 1976. As per the act the Noida authority acts as an autonomous body. 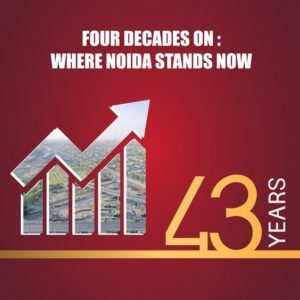 It took Noida nearly 4 decades to become the choicest destination of public at large to have their dream home in NCR. It all started from being an industrial town to a city of few residential societies under the shadows of highly populated National capital region. A home to many corporates and an industrial hub, Noida has grown leaps and bounds in recent years. Credit goes to the ruling governments of current and past years as well as Noida authority. Noida since start was a well-planned township with suitable infrastructure to fit both commercial and residential sectors. The town has become an eyecatcher for big real estate players mainly because of the infrastructure and connectivity. E.g. DND to Delhi, Noida expressway connecting East Delhi to Greater Noida, Yamuna expressway connecting NCR to Agra and Mathura as well as the FNG corridor. An added advantage is that most of the habitation area in Noida is now equipped with metro facility starting from Sector 15 right down to the sectors of Greater Noida. The town has witnessed immense growth specially in housing sector as it has a seemingly excellent connectivity with South and East Delhi via DND and Noida Expressway. As a result of the same, Noida has developed two of its extension areas as Noida Expressway which connects Noida to Greater Noida and Greater Noida (West) which connects Noida to NH-24 and other parts of Ghaziabad like, Indirapuram, Vasundhara. Currently real estate is enjoying much success at Noida expressway, Greater Noida and Greater Noida West. One of the most sought-after sectors in Noida is sector 150 on expressway which is the greenest of the town. The sector also has Shaheed Bhagat Singh park which is made facing few prominent projects like Ace Golfshire and Ace Parkway. So, right time to make a quick decision of home buying now.